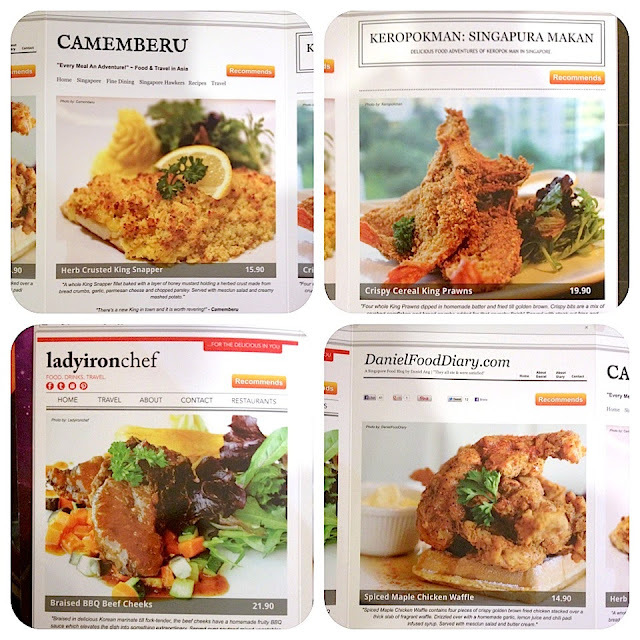 Have You Seen the Four Singapore Food Bloggers In Swensen's New Menu for Sept-Oct? Yeah these four! I thought it was a really fun idea when Swensen's approached us to do a special menu featuring bloggers making food recommendations. I don't think anyone has done this before. So yes, you'll see Keropokman, Ladyironchef, DanielFoodDiary and Camemberu on the Sept-Oct special menu - From The Bloggers' Palate. Oh, they have some interesting new dishes too, at pretty reasonable prices. I really like the fish they used here - King Snapper imported from the U.S. - silky smooth and tender, with the full sweetness of fish but without any fishy or frozen taste. 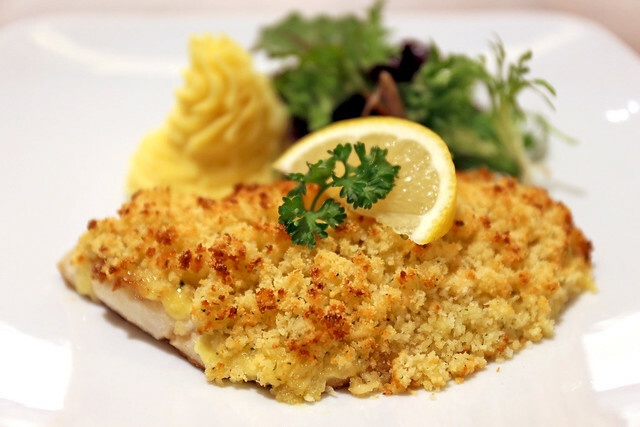 The herbed crust with bread crumbs, garlic, parsley and Parmesan gives savoury crunch, while the honey mustard holds it. And this is baked, not fried, so it's definitely not greasy. I hope they start using the King Snapper for other fish dishes too! 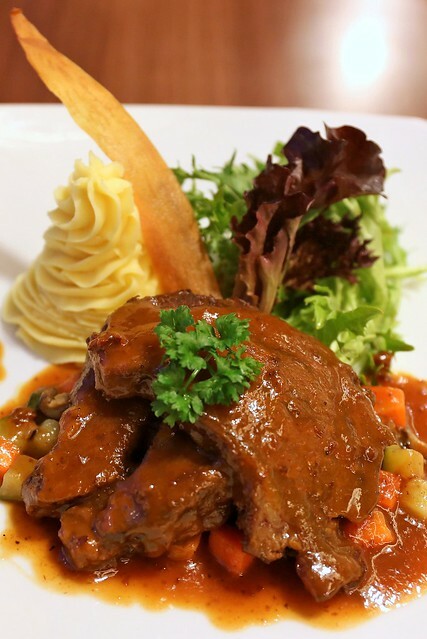 Served with creamy mashed potato and mesclun salad. This is like cereal prawns on steroids. 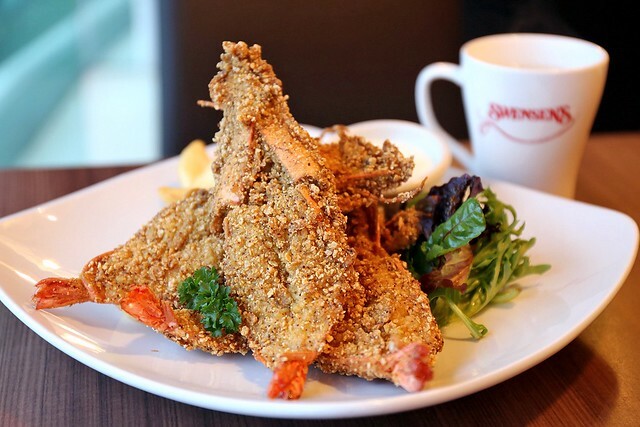 Three large whole king prawns are butterflied and coated with a housemade cereal batter (cornflakes, bread crumbs and seasoning). Then they are fried until even the skin is crispy (yes, I ate even the tails)! These are pretty big, so they will be quite filling, but you still get sides of steak fries and mesclun salad. 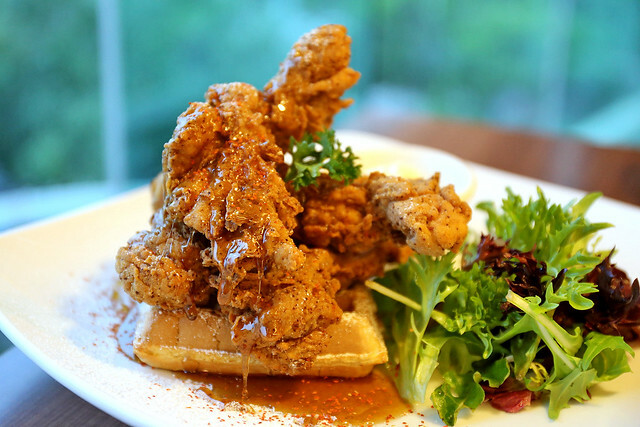 This one is really unusual - Belgian waffles with crispy fried chicken! Yes, you get your maple syrup but it's spiked with garlic, lemon juice, and chili padi flecks (not spicy though). Look at how it's dripping in thick slow motion. Served with mesclun salad and butter cream. You get sweet and savoury in the same dish. And with fried chicken so tasty, I think this is going to be a kids' favourite! Beef cheeks = tenderness, especially when braised for so long. This is like a gorgeous stew with rich, unapologetic flavours. It's a Korean marinade featuring garlic, soy, ginger, and fruits for natural sweetness. The whole ensemble is topped with a fruity BBQ sauce with hints of peach, seedless prunes, and pineapple. Served with creamy mashed potatoes and sauteed mixed vegetables. 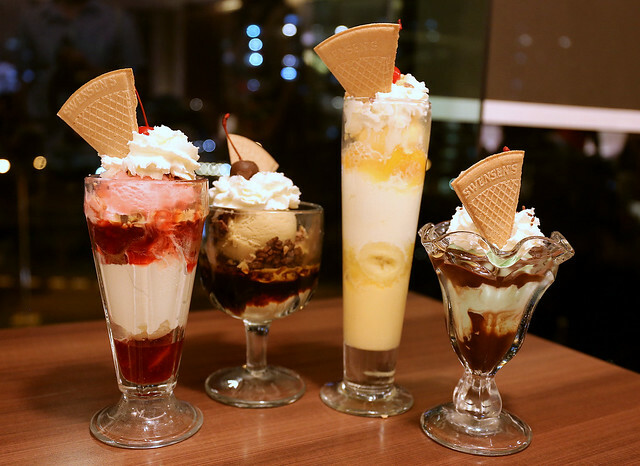 Of course, no visit to Swensen's is complete without ice cream or sundaes. There are special desserts paired with the dishes, as you'll see on the special menu. Mine's the Salted Gula Melaka Heaven (second from left, S$8.90 with the King Snapper, otherwise S$9.90) - creamy scoops of salted Gula Melaka ice cream with chocholate balls, diced almonds and chocolate morsels. Other desserts include the Chendol Delight (not pictured), Mango Fantasy (second from right), Merri-Mint (far right). These four dishes will be available from 1 Sept to 31 October at all Swensen's outlets, excluding Earle Swensen's branches (click the link to see locations islandwide). Interesting trivia: there are more branches of Swensen's in Singapore than in the United States! Wow, really cool. Have a lovely Friday. Greetings from Amsterdam. Thanks, hope you are having a lovely weekend too!